PDFmdx version 1.2.6 now has an integration with the PDF printer-service – PDF2Printer. With that the created documents can be put out on printers automatically. The printing output occurs for all single documents created within the scope of the PreSplit function. The information on which printer the output should take place, can be read out from the single documents via a data field of the PreSplit templates and used for the control of PDF2Printer. Via alias assignement it is possible to determine and assign a physical printer from a field read out from the document. If no suitable alias can be found or the information is missing in the document, the set “default printer” is used. The printing function can be activated and deactivated generally or per processing definition. 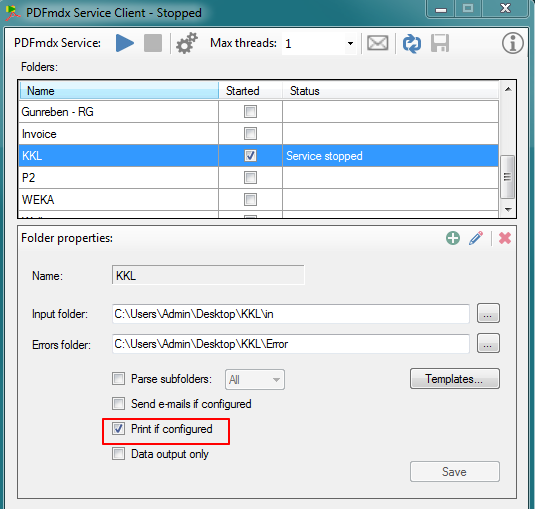 PDFmdx creates a unique subfolder inside the print-input-folder for each processing job (input document). The PDF single documents created from the splitting process get copied there. At the start of the further processing = printing process a “PDFmdx.pcf” (Print Control File) ASCII file gets genereted and copied into the subfolder at the end. The PCF contains the names of the PDF’s which should be printed and specifies the printing order as well as the printer which should be used. 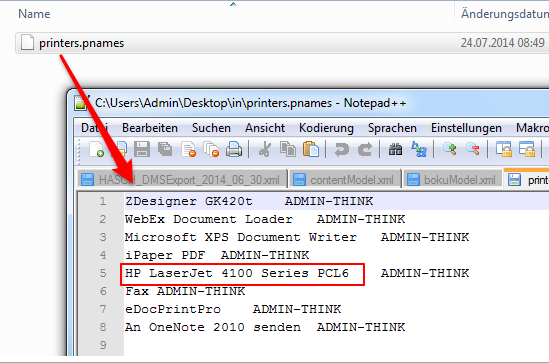 The PDF2Printer server recognizes the available “PDFmdx.pcf” file and starts the printing process. After the print was successful the subfolder gets deleted. PDF2Printer is an application, installed as MS-Windows service, to output PDF’s from a monitored folder to various printers automatically. 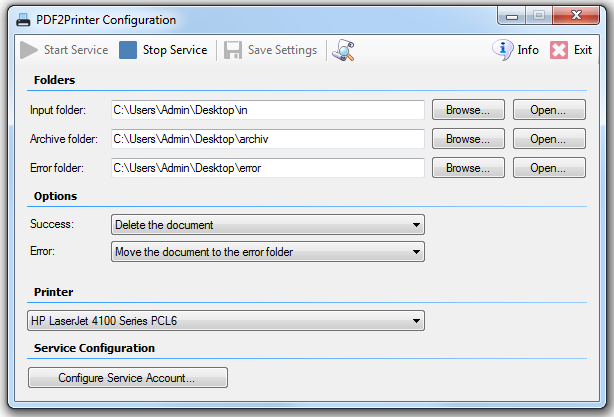 Configuration – Windows service account – as system or user account. With start / stop of the service an ASCII file (printers.pnames) containing the names of the available printers is created and written into the monitored in-folder. With that, integrated applications (e.g. PDFmdx) are able to read out, display and use the names of the available printers..
Sub-folder monitoring with PCF trigger-file (Print Control File) allows the triggered beginning of the print of PDF’s contained in the sub-folder. The printing process starts with the occuring of the *.pcf file. 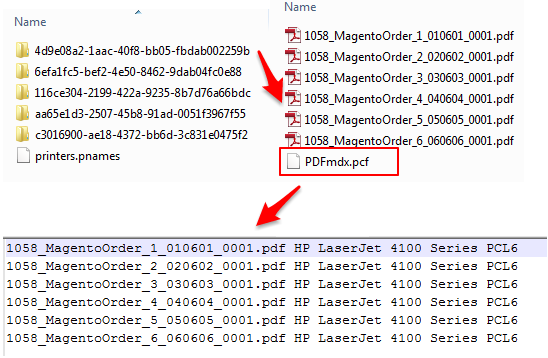 The PDF’s listed in the pcf-file get printed in the defined order on the also defined printers.